Previously some common errors that can be made by people unfamiliar with business intelligence software were discussed. To follow on from this we will now look at three more errors that can have a detrimental effect on the effectiveness of your Excel dashboard. We have already looked at how the inclusion or irrelevant or unnecessary charts can clutter and confuse your Excel dashboard. However even when appropriate and important charts are included in your dashboard it is still possible to make some mistakes when putting them together. Remember that the last thing that you want is for your dashboard to look overly complicated or even intimidating. Be sure to choose charts that are clear and easy to follow, and avoid having data points too closely spaced together. You want your dashboard to be attractive to its users, so that they will use it at every opportunity and gain the greatest benefit from this invaluable tool. Another mistake that can be made when putting together a dashboard is leaving out too much. This is not as common as cluttering, but it is equally serious. At all times when creating a dashboard it is important to keep in mind the ultimate function of the dashboard. If it is designed to provide an overview of KPIs or sales performance, it must include all data that is relevant to that topic. A single chart with a line going up or down is one of the worst examples of a dashboard, as the user is not availing of all of the detailed analysis and forecasting possibilities of the business intelligence software. It is also important to include enough data points on each chart. Again be careful not to clutter, but also do not under-represent your data either. And finally, the cardinal sign of dashboard design – no clear conclusion. Imagine a dashboard with attractive charts and a good layout, that due to one factor or another is completely useless. For example there may not be enough data, some or all of the charts may be irrelevant to the conclusion that is required, or the charts may be pertinent but completely irrelevant to each other. 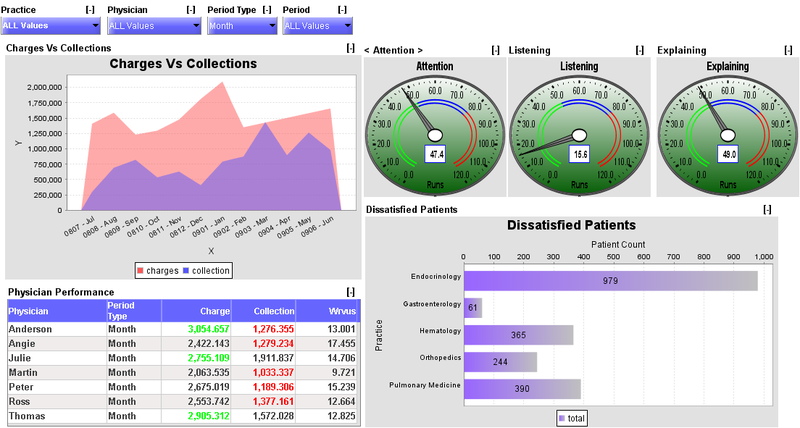 A good dashboard provides the user with a clear conclusion, backed up by easily accessible data. If the user has to trawl through each and every graph to try to work out where they stand on a particular issue then the dashboard is a failure. When designing an Excel dashboard the key approach is to always keep in mind what the finished product should do. Whenever a decision is to be made, the designer should review the criteria for the dashboard and then choose accordingly. If this simple rule is followed the Excel dashboard will be an exceptional asset to any business or organisation.